Functional armour There are 28 products. 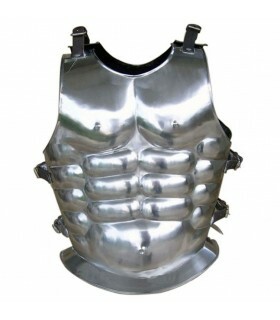 Roman muscled armor life-size self-adjusting and functional silver. Suitable for chest size: 120 cms. to 145 cm. 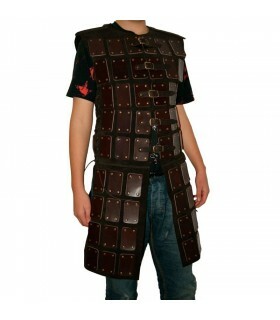 Brown muscled brown armor self-adjusting via six strapswith buckle. Made of cowhide. 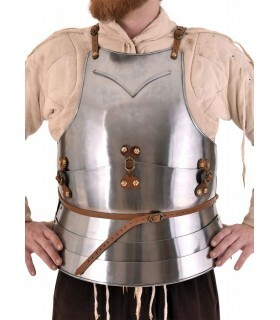 Also used by the Greeks./ p>Circumference Chest: 110-130 cms. 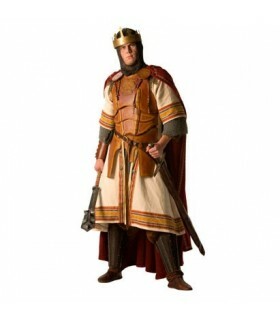 Set consisting of Peto and Back of Medieval King. Functional pieces made of polished steel 1mm (19ga) thick. 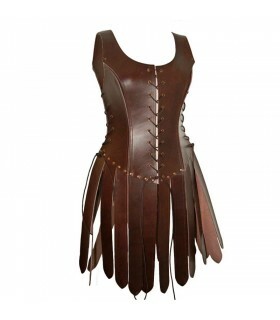 They include leather straps and buckles. 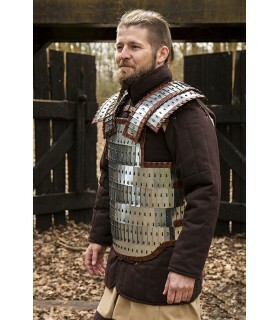 Adjustable Viking armor made of polished steel. Size M / L.
Peto warrior Rider of the ensemble Lena, made of carbon steel with a thickness of 1.2 mm is Available in 2 sizes and is adjusted by means of leather straps. Lorica segmentata manufactured in 18G steel with cast bronze details. 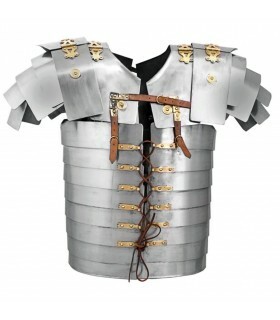 The segmentata lorica is the name given to the armor worn by the Roman legionaries during their time of splendor (1st century BC-3rd century AD). 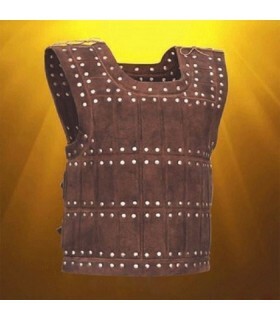 The name comes from the Latin word for segmented, which refers to the division into metal plates of the armor. mature serrajer made leather. Ability to couple it pads. 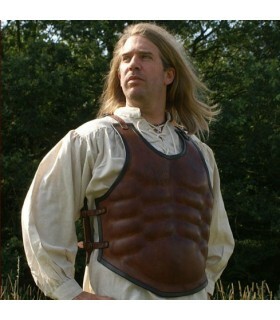 Length light armor made of split leather. 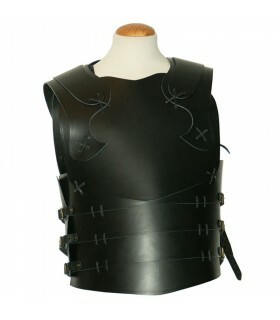 Elegant ideal for scouts, or warriors lightweight design. It is adjusted by lacing on the front and sides for optimum placement. Available colors: black, dark brown, light brown, olive green. Let us know your chest measures waist and hips to its making. 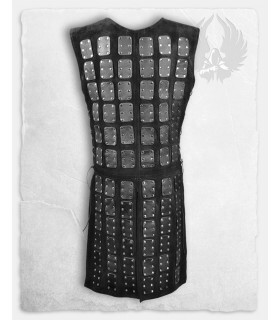 Armor made of leather about 3.5 mm thick. 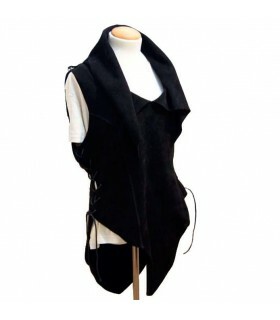 A piece that combines the protection of armor but with the convenience of a fur, for girls warrior. Ability to couple it pads. It is done in light brown, dark brown, red and black. Other colors on request. Let us know your chest measures waist and hips to its making. Light Armor model Elbin leather handcrafted in suede. 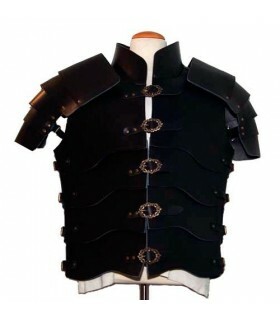 It is a lightweight full body armor with elgante ideal for explorers and warriors design. It is adjusted by lacing on the front and sides. Available in various colors. 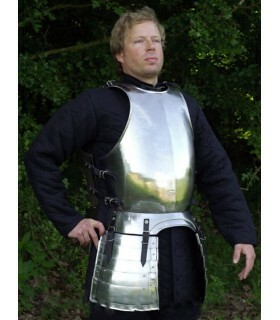 Medieval armor and tunic Rey luxury. 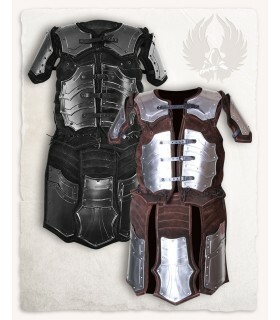 It includes:Leather Armorroyal robe. 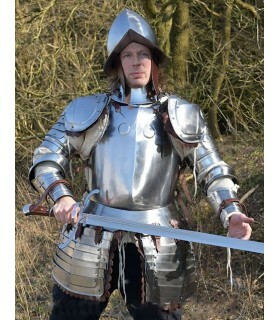 Caudillo armor made by hand in leather with a thickness of 3.5 mm. 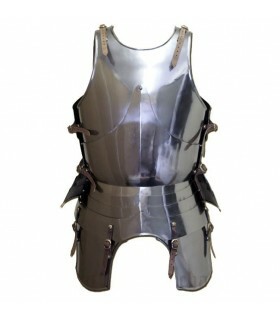 It is a medieval armor for the entire torso and is adjustable by straps. Available in various colors and sizes. If you want another color or if you need another size that we do not have, consult. 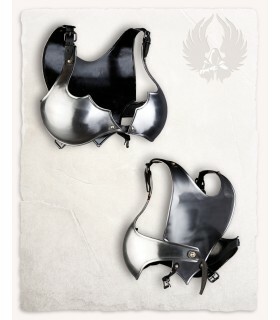 Breastplate and backplate of the fifteenth century Milanese. Made of steel of 1.2 mm. thick. with straps and brass buckles to adjust. Chest: 125-143 cms.Waist: 112-127 cms. Lorica segmentata made of stainless steel with cast bronze details. The segmentata lorica is the name given to the armor that led the Roman legionaries during its heyday (I. C-III century AD centuries). The name comes from the Latin word for segmented, which refers to the division into metal plates of armor. 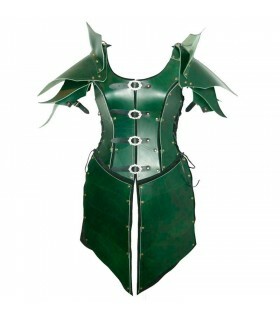 Steel armor for women that consists of pectoral and steel back joined by leather straps and buckles to adjust. The rivets are decorative. This piece is one size (women of thin build). 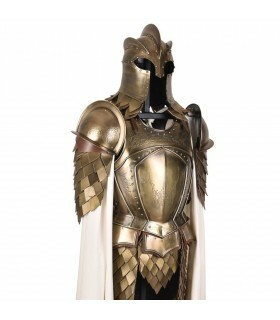 Precious Armor of the Royal Guard with scales and carved designs. Manufactured in steel with aged brass finishes. It comes equipped with adjustable straps with buckles, padded cotton hat for the helmet, white cotton layer and steel bracket for display. Brigantina model Osric made of split leather. The brigantine is reinforced with 3 mm leather pieces. of thickness making the piece very light and flexible, apart from giving it extra protection. 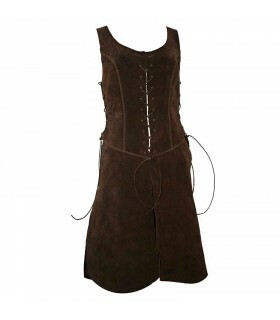 It is adjusted by means of leather side straps and closed at the front by means of a buckle closure. 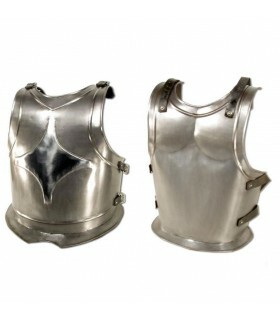 Full armor for the amazon model Lena manufactured in carbon steel with a thickness of 1.2 mm The armor is a size S/M which corresponds to a bra size to cup B. 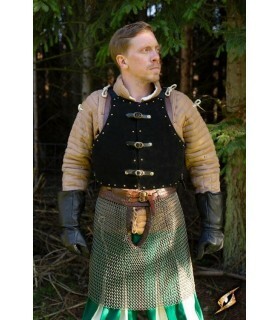 The parts are joined together and adjusted by leather straps.This plate armor is very versatile and can be used to complete their costume, warrior rider, elf, or even a warrior priestess. 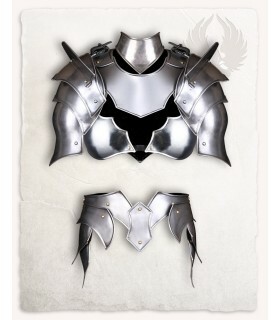 Armor for the noble warrior. 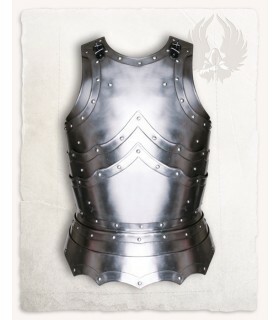 The breastplate medieval Epic Armoury is a beautiful armor of fantasy that protects the front and back. 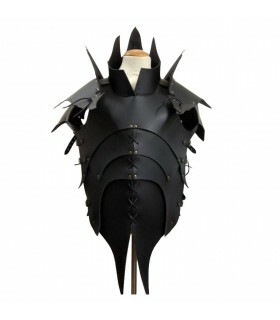 The armor rests on the waist and is sculpted to fit the body. This piece riveted steel has been covered with a luxuriously soft layer of suede leather, which gives it a particularly rich.